The Jacman Group provides a range of electrical safety services for industrial facilities throughout North America. We specialize in Arc Flash/NFPA 70E Electrical Safety Training and facility Arc Flash Risk Assessments, and we also offer comprehensive facility audits, program reviews, and program development to help companies work toward compliance with electrical safety and a safer workplace. The Jacman Group’s mock OSHA inspections and audit of your safety programs and training are extremely helpful in identifying weak areas of a safety program, safety training, safety documentation and other potential issues. Safety procedures are compared to applicable OSHA regulations; a walk-through of the facility is performed to determine physical violations; and employees are interviewed. Programs that are required by OSHA are also reviewed (e.g., written programs, work practices, record keeping, employee work practices and work environments) and evaluated to assess program status. As a result of our safety audits, underlying currents are commonly identified allowing your company to correct the problem before other areas of an operation become affected. Our Electrical Safety Audit & Gap Analysis identifies the potential electrical hazards to better protect your employees, minimize the loss of life and equipment and assess compliance with OSHA and employer standards. This audit is an assessment of your facility based upon the NFPA 70E Standard for Electrical Safety in the Workplace. The audit requires just 1-2 days depending on the size of your site and consists of inspecting the facility and equipment to identify gaps in labeling and markings. The auditor can also interview selected employees and review your Electrical Safety Program including Lockout/Tagout Procedures. Upon completion of the Electrical Safety Audit, we provide a formal written report with the recommendations for improvements. This report will list out any gaps in NFPA 70E Electrical Safety in the Workplace including required labeling, documentation, policies, procedures, and safe work practices. We’ll then make recommendations for the path forward to a safer workplace and compliance. You’ll feel better knowing, instead of hoping you’re facility is safe and compliant and your employees and their families will thank you. We can review your current Electrical Safety Program and assist in maintaining your current procedures based on new equipment additions, new rulings, or physical changes at your facility. 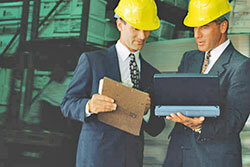 We can also assist in developing or writing any new procedures that are required.